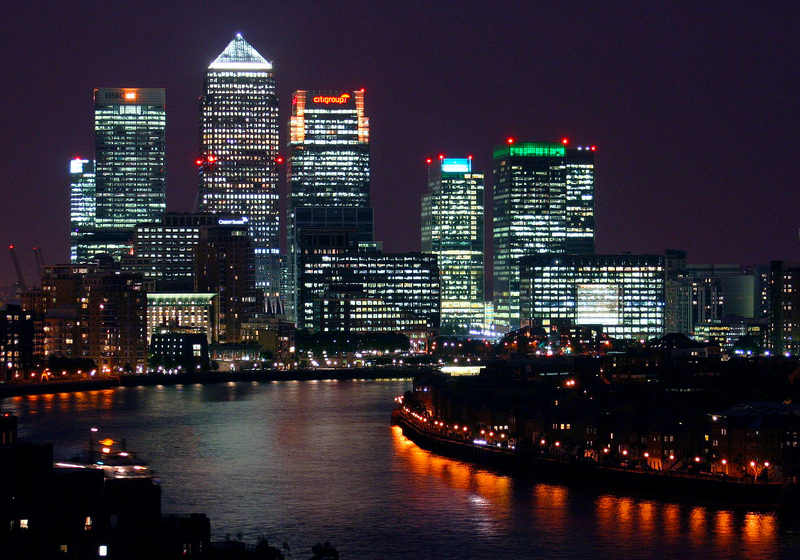 British banks have been the subject of a wave of criticism by U.S. politicians in recent months. The Libor Scandal and the money laundering charges against HSBC’s Mexican operations grabbed headlines earlier this summer. Last week, the New York Department of Financial Services accused Standard Chartered, a London-based bank, of violating the U.S. sanctions on Iran. Some British observers have argued that these accusations are motivated by simple protectionism and a desire to ruin London’s reputation as a financial centre and thus drive business back to New York. Many Britons remember that in the aftermath of the 2010 Deep Water Horizon oil spill in the Gulf of Mexico, American politicians stressed that “British Petroleum” was a foreign entity. The attacks on British corporations in the United States appear to have involved a certain amount of grandstanding by Congressmen and ambitious prosecutors. However, the frequency and virulence of these attacks may also be a sign of decreasing American self-confidence in an age of perceived relative decline. We have seen the revival of the sort of anti-British sentiment that was last popular in the United States in the nineteenth century, when Britain was still the world’s most powerful nation. Pulling Down the Statue of King George III, N.Y.C. 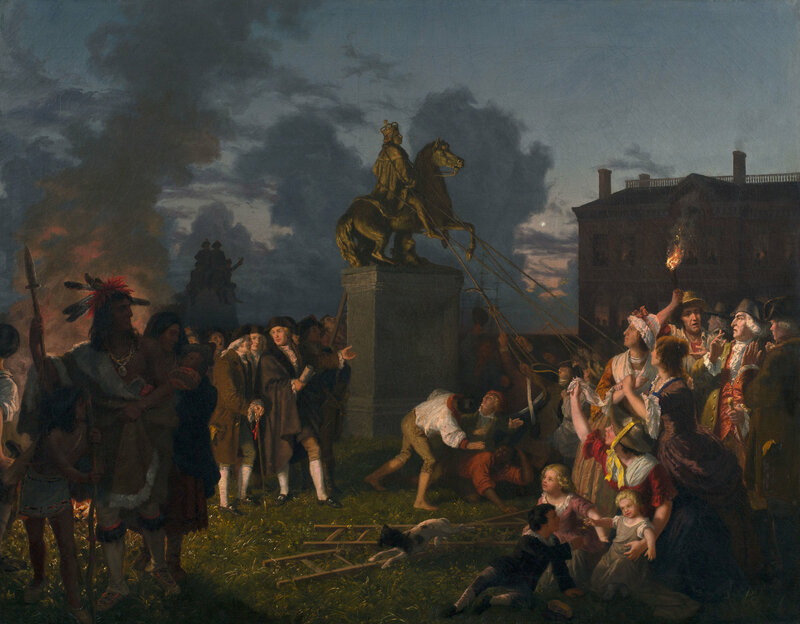 A romanticized depiction of the Sons of Liberty destroying the statue after the Declaration was read by George Washington to citizens and his troops in New York City on July 9, 1776. Prior to the First World War, Britain was the primary target of U.S. economic nationalism. Most Americans welcomed British investment in the American economy but they also feared it might undermine their political independence. Memories of the American Revolution and the War of 1812 were still fresh. During Andrew Jackson’s war with the Second Bank of the United States in the 1830s, critics of the bank noted that some of its shareholders were British. Britain’s perceived support for the cotton-producing South in the Civil War intensified Anglophobia in the northern states. After 1865, both of the major political parties engaged in selective Brit-bashing. The Republicans, the protectionist party, focused on the need to keep the tariff high so as to include foreign manufactured goods, a policy that clearly harmed Britain, which was then the workshop of the world. Somewhat ironically, most Republicans were ardent supporters of the gold standard, which was essentially a British invention: in the nineteenth century, countries from Portugal to Japan adopted the gold standard so as to link their currencies to those of the world’s foremost power. Democrats typically favoured lower tariffs, a policy that was popular in the western and southern states and which would have helped British manufacturers. However, many Democrats were hostile to the gold standard. The 1896 Presidential election, which pitted Democrat William Jennings Bryan against Republican William McKinley, became a de facto referendum on whether the United States should remain on the gold standard. Republicans charged that departing from the gold standard would destroy the confidence of European, largely British investors and would, in effect, be an act of confiscation. Gold, they declared, was the currency of Western civilization, since only backward nations such as China still based their currencies on silver. The Republicans, along with their friends on Wall Street and in the City of London, predicted apocalyptic consequences should Bryan be elected. To twenty-first century ears, Bryan’s rhetoric is remarkably similar to that sometimes used by leftist leaders in the Third World whenever they seize the assets of a Western company. In the 1890s, they were as American as apple pie. The 1880 and 1890s also witnessed a political campaign in the United States against foreign, especially British investment. As historian Mira Wilkins has shown, the flood of British capital into the United States after 1865 contributed enormously to U.S. economic development: British investors financed everything from transcontinental railroads to ranches to factories. She also shows that there was a political reaction against British control. British investors were demonized in some newspapers and laws limiting foreign investment were passed by some western states. In 1887, Congress prohibited land ownership by foreign citizens in the western territories in response to complaints from small ranchers that rich British cattle companies were engrossing grazing land. This statute influenced state politicians: laws banning land ownership by non-citizens were passed in Illinois, Kansas, and Texas. The Glasgow Herald dubbed this trend the “Monroe Doctrine” applied to capital. The attacks in the American press on William Scully, an Irish landlord who had acquired vast numbers of tenanted farms in the mid-west, intensified so much so that he decided to take the precaution of acquiring American citizenship in 1895. Hostility towards British investment dissipated largely because of the growing power and self-confidence of the United States after 1914. The First World War dramatically changed the position of the United States in the world economy. Within the space of a few short years, it replaced Britain as the world’s largest creditor nation. In this new context, it was anachronistic to worry that British investment as somehow going to undermine American sovereignty. By 1945, the transition from British to American global hegemony was essentially complete: the City of London was just a shadow of its former self: Wall Street was now the undisputed financial capital of the world and the British economy was dependent on Marshall Plan aid. Few if any American politicians in the 1940s or 1950s worried about the extent of British economic power in the United States. In fact, they were more likely to complain about Britain being a charity case. In recent years, we have heard much about America’s relative decline. Books with titles such as “The Post-American World” have become best-sellers. Those who speak about American relative decline usually focus on the rising fortunes of the BRIC countries, not Britain, which is itself suffering from the problems in the Eurozone. However, the fact a great deal of business migrated from Wall Street to London after the passage of SarbOx is a datapoint that has been used to support the overall narrative of American decline. The sapping of American self-confidence and the resurgence of U.S. economic nationalism has serious implications for European companies, especially British ones. Britons may like to think that their close cultural ties and military alliance with the United States will protect their companies from U.S. economic nationalism. It may be that the social memory of the American Revolution will be a greater influence on U.S. thinking about British companies. A certain degree of anti-British sentiment is still present in U.S. culture. Every U.S. schoolchild learns about the revolutionary struggle against British rule. Even seemingly apolitical films have a whiff of Anglophobia: in the 1977 film Star Wars, the soldiers on the nefarious Death Star were played by actors with British accents. All of this means that grandstanding U.S. politicians have a rich cultural legacy to tap into when targeting British firms. Speech by William Jennings Bryan in Official Proceedings of the Democratic National Convention Held in Chicago, Illinois, July 7, 8, 9, 10, and 11, 1896, (Logansport, Indiana, 1896), 226–234. Mira Wilkins, The History of Foreign Investment in the United States to 1914 (Cambridge, Mass: Harvard University Press, 1989), 566. New York Times, “Alien Land Law” 24 December 1891, New York Times, “Irish Landlords in America” 20 March 1886. Glasgow Herald, leading article, 26 September 1891, 6.